It doesn’t take long to master the basics of using Disqus including all the best commenting and moderation features and shortcuts. Whether you’re new to Disqus or have been around this corner of the web for a while, it’s easy to learn something new every day. In this post, we wanted to share our favorite Disqus features that most people might not know about, but should. We hope you find these tips useful and if you’d like to share some of your own, post a comment in the discussion below! Similar to embedding tweets or Youtube videos, you can embed any Disqus comment into an article or blog post. Embed comments to highlight the top comments from your community, recap a recent discussion, or promote discussions happening across the site. Ultimately, this is a great way to reward commenters for their contributions and increase engagement. When posting a comment, upload images (JPG, PNG, or GIF) to your comment by dragging the file directly into the comment box. If the site allows rich media posting, you’ll see an image icon at the bottom-left corner of the compose box. This can save you a few steps that over time can really add up. If you’re not sure which comment a reply is being directed at, hover over the reply icon adjacent to see a preview tooltip of the parent comment. This is especially useful when reading a sub-thread with lots of replies. 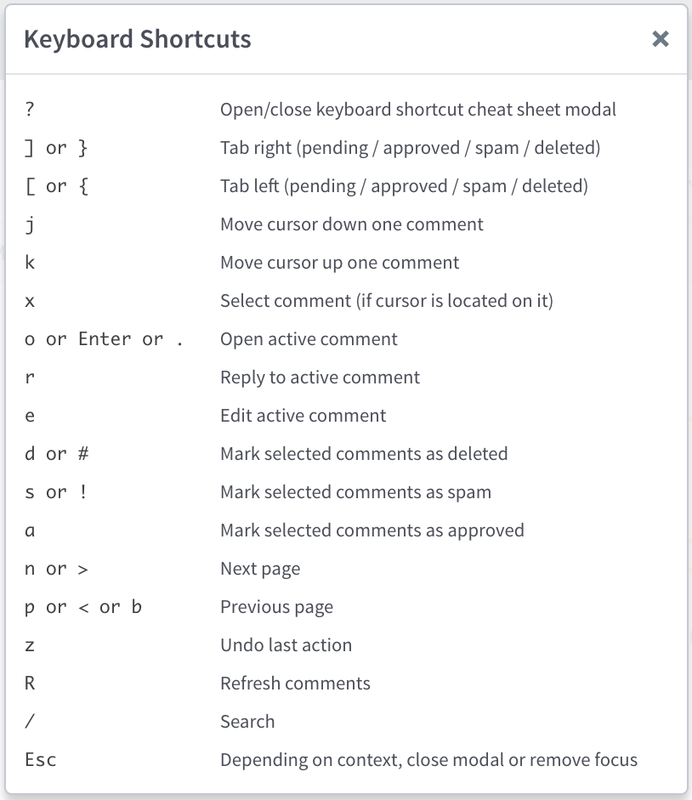 The Moderation Panel offers over a dozen helpful keyboard shortcuts for navigation, moderation, and more. My personal favorite shortcut is toggling specific queues by number (e.g. 1 = “Pending”, 2 = “Approved, etc). If you ever need a reference, type “?” to trigger the cheat sheet. Pro-tip: When posting a comment on an article page, use CMD/CTRL + Enter to submit the comment. If you’re noticing that a lot of comment flag reports do not require a moderation action (e.g. delete, mark as spam), you can identify the flagging user(s) if the comment has only been flagged once. Just hover over the red “Flagged once” tag on the comment in the Mod Panel to see the Disqus username of the profile that flagged it. You can remind the user about the comments that they should flag (e.g. inflammatory, spam) to improve the signal of reports you are receiving. You can moderate comments via email notifications with three simple commands: Approve, Delete, and Spam. Remember to reply above the notification text, respond only with the appropriate single command word, and to not include any email signature. You can also post a comment reply to a new comment notification by responding directly to the email. If you use Slack, you can also set up moderation workflows using Zapier such as being notified of newly posted top-level comments or whenever a comment is flagged. We use these workflows in our own company Slack to manage moderation of comments on this blog a lot more easily. Also, enable our recent integration to automatically embed any Disqus comment link you share in a Slack channel using a simple command. Commenters can get pretty passionate sometimes depending on the topic (e.g. politics, religion) and unfortunately that can make moderation more difficult. 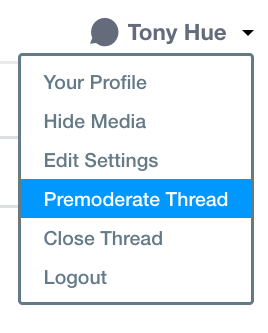 If you’re anticipating that a new story may get unruly, turn on pre-moderation for that individual discussion. Publishers have two options for activating thread-level pre-moderation: in the Moderation Panel or the article page. This will send all comments automatically to the Pending queue for a moderator to review. This provides a flexible alternative to pre-moderating all comments on your site which may not scale effectively if you have limited resources for moderation. If you have a guest author on your site, you can add them as a moderator for just an individual article versus the entire site. 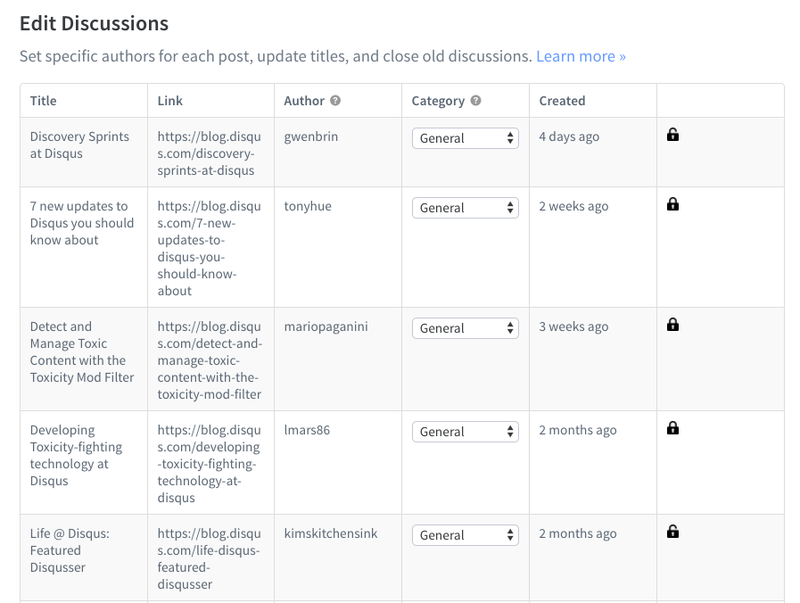 To start, head over to the Discussions Editor in your Moderation Panel, find the specific article(s), and update the Author field with the author’s Disqus username. You can only add one author per discussion. Pro-tip: If you’re hosting a Q&A discussion, add your guest as a moderator for the Q&A thread so that any of their comments in the discussion will show the site’s moderator badge. Permanent bans allow you to remove an unwanted user from participating in your community forever. In some cases, it may be too severe of a penalty and so instead, you should consider enforcing a timeout (aka a temporary ban). For example, one of your regulars could simply be having a bad day, someone new joins the community and is less familiar with the rules, or a particularly controversial story instigates a lot more heated interactions. When a user is placed in a timeout, they are notified of the duration of their timeout period in which their commenting privileges are restricted. 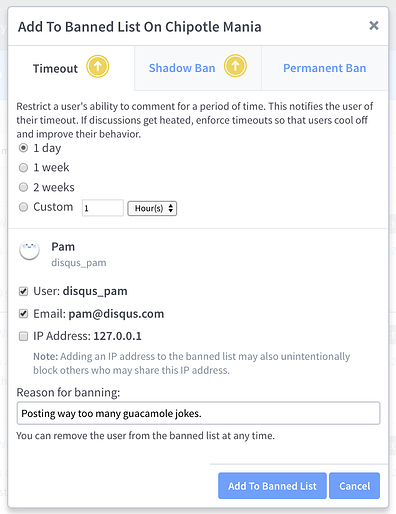 Timeouts require a Disqus Pro subscription and can be previewed during a free 30-day trial. The Restricted Word Filter automatically flags any comment containing certain keywords you’ve specified to require moderation review. It also works on the Display Name of any account that posts comments on your site. So for example, if “pineapple” is in your Restricted Word Filter, all comments from an account whose Display Name is “Pineapple Express” will automatically be sent into the Pending queue. 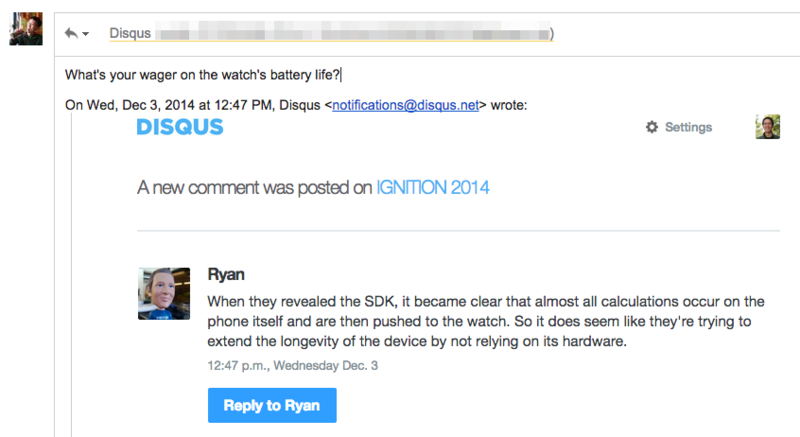 Tell us: Which little-known Disqus features do you use most? 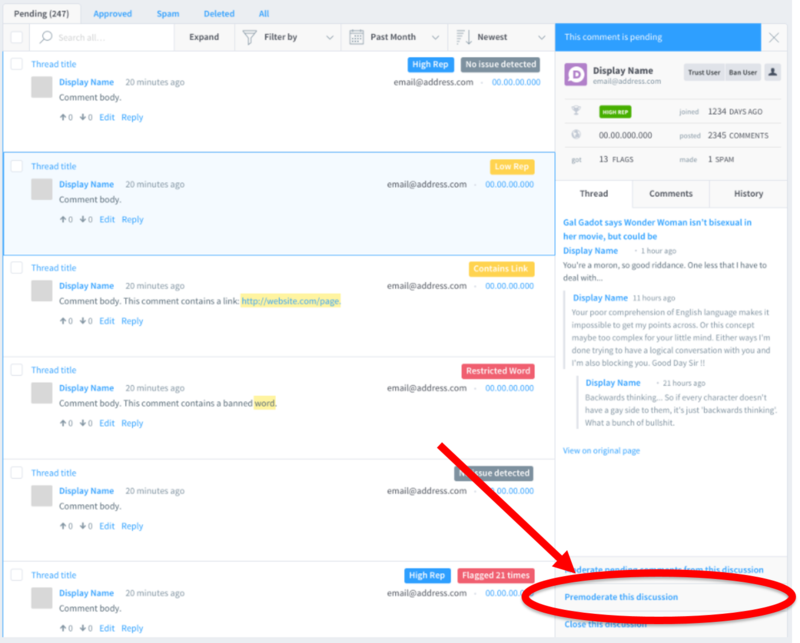 Those are just some of our favorite “secret” features on Disqus. We’d love to hear from you too! What little-known Disqus feature has made commenting or moderation easier for you? Share yours in the discussion below and we will feature the best one.